We own and love a couple of educator MaryAnn Kohl’s art books for kids, so I was thrilled to join the book tour for her newest book, Action Art. We were sent a copy, and my kids immediately marked all sorts of activities for us to try! I am sure your kids will love this book as well, so be sure to enter the giveaway for a copy at the end of this post (open worldwide; if a US reader wins they will receive a physical copy of the book; if an international reader wins they will be sent a PDF copy). 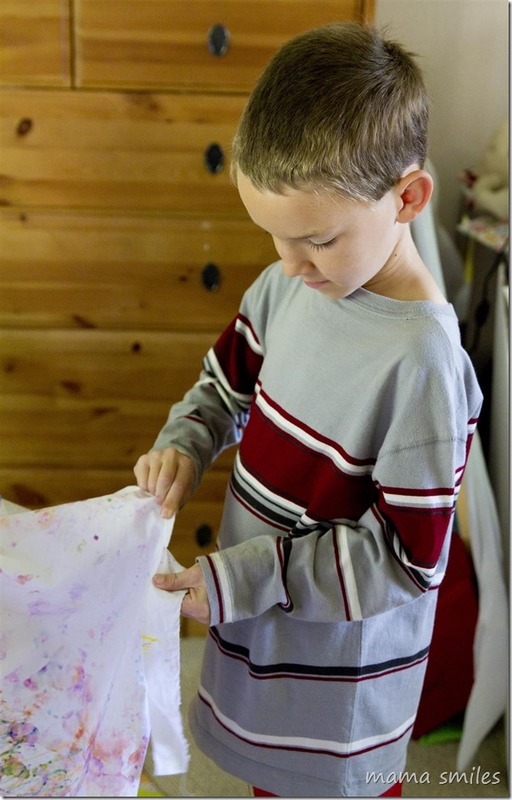 Today’s post is based on the Runaway Sheets activity on page 12, but we took the activity as inspiration and ran in our own direction. This post includes affiliate links, and purchases made via these links earn me a small commission at no cost to you. Thank you for supporting my site! 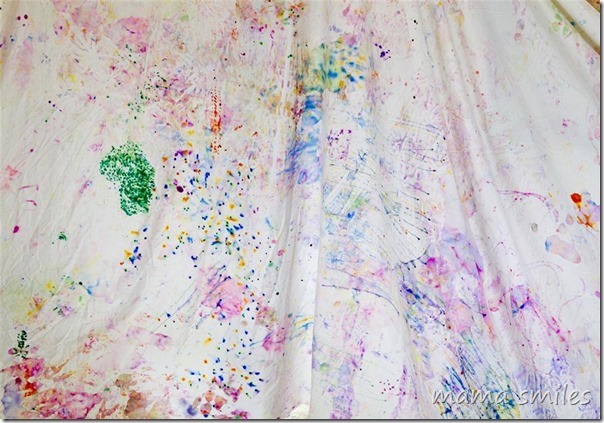 MaryAnn Kohl’s activity uses paint and a sheet. I needed to cook dinner and I knew I could trust the kids with Sharpie pens (they are well trained) but paint was going to get messier than I could deal with that night. We had an old sheet with a tear in the middle that I had been saving for the right activity. This was it! I folded the sheet up and the kids colored it, flipped it over, then colored some more. This kept them busy for a good 45 minutes. We did get a couple of places where the marker bled through to our concrete patio, so if you are worried about that happening put a shower curtain liner or other plastic under the sheet. Once the kids were done decorating, we poured rubbing alcohol over the sheet so that the colors would disperse – chromatography themed art!. Since we didn’t dip the entire sheet into rubbing alcohol, some of the pen was left untouched. Now for the runaway sheets portion of the activity! 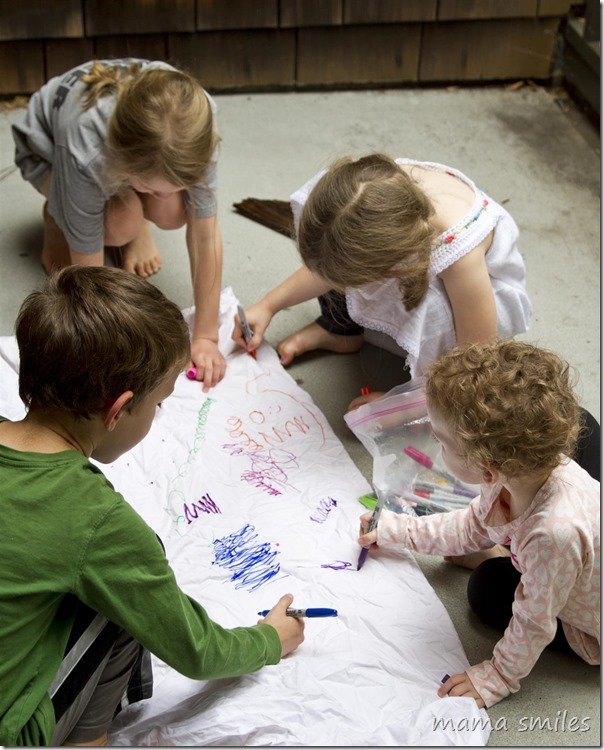 All four kids really enjoyed ripping the sheet! This is a wonderful gross motor activity – as are all of the action art activities in MaryAnn Kohl’s book! 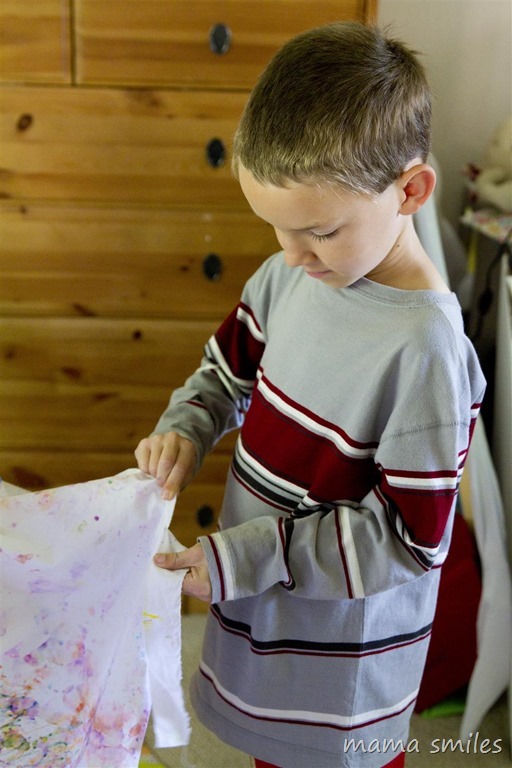 MaryAnne Kohl’s activity uses the sheet differently from how we plan to. I don’t want to say how it differs, because you need to read the book (and our follow-up post once this project is finished) to find out! We haven’t gotten to that part of the activity yet, because we have been busy visiting friends and family, but our ball of sheet yarn is waiting. Can you guess what we are going to make? It will be a functional product made using process art! Go to this post to read more! Whether you are looking for art activities for kids who love to move or ways to get kids who love to sit and do art activities moving, Action Art is a book I can highly recommend! We have bookmarks spread throughout the book of activities the kids want to try as written or that we plan to spin off of, as we did with this activity. If you know children who would enjoy this, please enter the giveaway for the chance to win a copy! 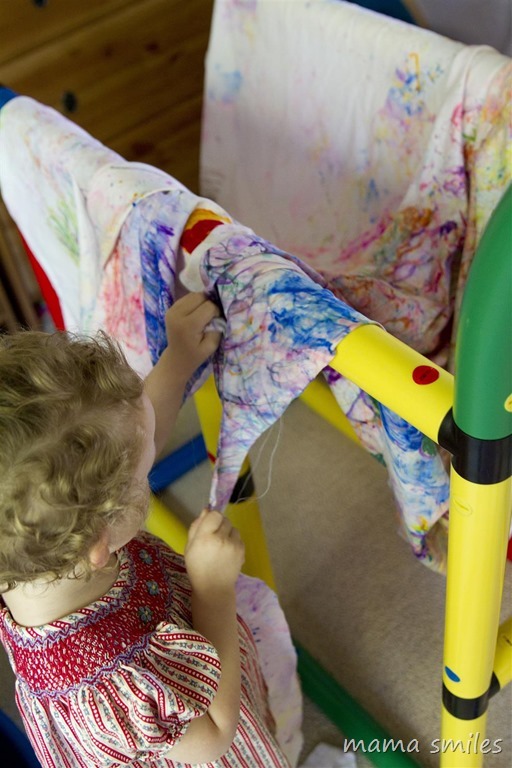 Do you have an action art activity to share? My kids would love to do that activity. We did t-shirts with sharpies and rubbing alcohol, but this would be even more fun. We are having a lot of fun with it! The kids found tearing the sheet tremendously satisfying. What a fun project. I always enjoy seeing your kids of different ages working so well together. I am very grateful that they get along so well! Thanks! We are having a lot of fun with both the book and this project. What a great effect! That turned out amazing. This summer my kids are doing some of the projects in MaryAnn F. Kohl’s book Discovering Great Artists. At the end of the summer we’re going to go to the Getty Museum to see pieces in person by the same artists. So far we’ve done Van Gogh, Courbet, Giacometti, and Monet. What a great summer activity! We don’t have that particular book of hers, but it sounds well worth getting. How fun, MaryAnne! My kids would love this. And wow they’re pretty trained with Sharpie pens! I think I could leave them alone with paint but not Sharpie pens (too permanent for me lol!). I would like to win this for my daughter in law. This would be a great activity for my grandkids and myself to enjoy together, thanks! Id like to win this for homeschooling! What a cool activity! My guess is you will crochet a hammock. Maybe that’s just because I wish I were in a hammock right now. :) I’m in holiday mode already… Leaving tomorrow! I am not crocheting a hammock, but I love that idea! I love how you saved a sheet for just this kind of project!! Good planning!! It turned out great!!! We to love MaryAnn Kohl’s books in our home. Can’t wait to see the next step in your art project! I’d like to win because my kids are all heavily into art and this would be a great resource for ideas! For my mom to share with the kids she teaches! I love Kohl’s books! They’re so filled with fun process art for kids! We home school and are always looking for new crafts to try! 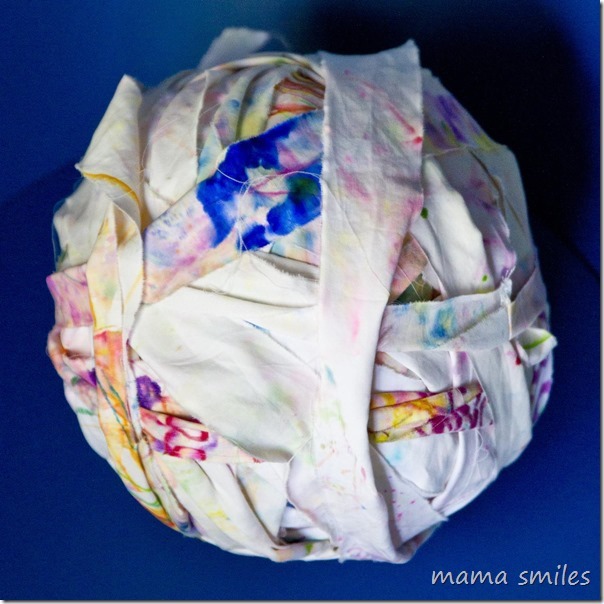 I would like to win this book to use in our homeschool art class….my three children would love it! I would like to win this so my daughter can get ideas on crafts for my Grandson and herself!! My children are constantly looking for ways to reuse items, they would love this!